A gummy smile can lead to a decline in self-esteem and confidence. Luckily, Dr. Hanna Mansoor is here to help Gilbert patients suffering from gummy smile issues. Using the latest in dental technology, she can quickly and easily correct these problems so that patients feel better about their appearance. A gummy smile is a dental problem when patients have too much gum showing above their teeth. This is particularly apparent when they smile, as the amount of gum showing might overwhelm the teeth. Another common name for this problem is excessive gingival display. While there’s no set guideline on what qualifies as too much gum, studies have shown that most people would define a smile as gummy when there are more than four millimeters of gum tissue showing. Statistics show that about 14 percent of women and 7 percent of men have a gummy smile, so it’s a problem many Gilbert patients come to Dr. Mansoor for help correcting. With a simple laser procedure and sometimes veneers, Dr. Mansoor can correct the imbalance of gum tissue so that patients have a smile they feel confident in. Having too much gum tissue, especially around the teeth. Having an upper jaw that protrudes out too much. Having a short upper lip, as this reveals more of the gums when a person smiles. Having hyperactive muscles in the upper lip, as this raises the lip more than usual. Having other abnormalities in the jaw, teeth, facial muscles, or lips. 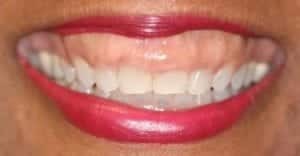 What Is the Treatment for a Gummy Smile? There is no reason for Gilbert patients to keep suffering from a gummy smile. Rather than hiding behind a closed-mouth smirk, patients can laugh out loud with their full grin after receiving gummy smile treatment from Dr. Mansoor. There are numerous procedures she can use to help her patients regain their self-confidence, most of which are completely non-surgical in nature. While patients might be more familiar with Botox as a means of correcting sagging skin and wrinkles in the face, it’s also a vital tool for correcting problems with the upper lip that can lead to a gummy smile. Botox works as a muscle relaxant, so by injecting it into the upper lip, Dr. Mansoor can paralyze hyperactive lip muscles to help the upper lip stay in position better. Unfortunately, this procedure is only a temporary fix for the problem, so patients will have to return for more injections every so often to preserve their non-gummy appearance. For a more permanent solution to a gummy smile, Dr. Mansoor may recommend dental laser treatments. This is the most popular solution for gummy smiles, as it completely eliminates excess gum tissue without invasive surgery. Also, known as crown lengthening, dental laser treatments are primarily performed with the WaterLase laser. This cutting-edge technology uses a combination of light and water to gently remove excess gum tissue, providing an experience that is primarily pain-free. In fact, the process is so smooth that some patients don’t even require anesthetics to numb their mouths beforehand. Dr. Mansoor will use the WaterLase tool to reshape the gums and remove excess tissue. This will show more of the tooth, providing a bigger and brighter smile with less gum in the way. Because the tool is extremely precise, it limits damage to surrounding tissues, practically eliminating the risk of infection in the mouth. It also immediately cauterizes the gums as soon as a cut is made, which lowers the risk of bleeding and makes healing go much faster. Surgical lip repositioning to ensure the lip covers the gums when the patient smiles. Maxillofacial surgery to reposition the jawbone, so it does not protrude so much. Surgical sculpting of the gums to reduce the amount of tissue and better highlight the natural contours of the teeth. Patients can benefit from these procedures to help them get the smile they’ve always wanted. Gilbert patients don’t have to keep worrying about their smile. In just one quick procedure, Dr. Mansoor can quickly eradicate these fears and provide patients with the stunning smile they’ve been dreaming of. Her careful attention to the patient experience and use of cutting-edge laser technology truly makes her the best choice for gummy smile problems in all of Gilbert. What are you waiting for? Schedule your consultation with Smiles by Hanna in Gilbert today by calling (480) 279-3700.